there is nothing i can say that is good about this plant. sorry; no “good news/bad news” this time. it is one of the most difficult weeds to eradicate, because it reproduces via underground rhizomes, so if you leave just a teensy little bit of the roots in the ground, before you know it you’ve got another whole crop. and boy, do i have a crop. it’s my best crop. fortunately, it’s another indicator weed, and it grows best in low fertility soil. so basically, it’s just growing in the border of my vegetable garden, where i’ve mulched with wood chips. that’s not to say it hasn’t tried to creep out into the middle… but it doesn’t really thrive in very fertile soil. its latin name is Artemisia vulgaris, and it is native to europe. according to my research, it was originally used to flavor beer until hops became more commonly used. probably why we have it now; it was likely imported by the colonists. it also has quite a few medicinal uses, and was even believed to ward off evil spirits. it can also cause contact dermatitis. lovely plant. your best bet to get it out of your garden is to pull, pull, pull, until you’ve exhausted the root system. to that end, don’t let it leaf out and replenish those roots. for more information, see this info from ohio state, or this pdf file from the virginia cooperative extension service. The dried leaves of mugwort were used as a tea replacement by the early colonists and by the working class in England about 75 years ago; it has a combination acrid and sweet taste. The leaves and large root minus the rootlets were used medicinally for their tonic and slightly stimulant properties. It was used for stomachaches, palsy, epilepsy, and other similar affectations. I wouldn’t use it as a tea or a medicinal, but readers might like to know that it repels insects and could be used in a bouquet along with tansy and wormwood on the picnic table! 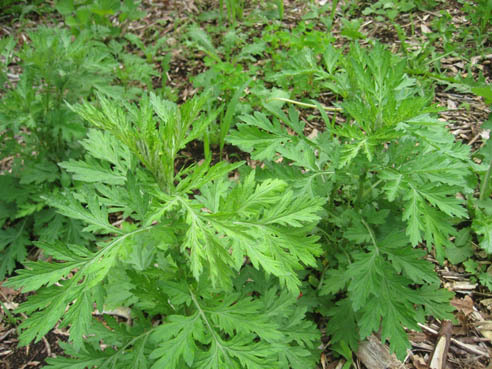 It is said the word “mugwort” comes not from the word mug but from “moughte,” which means a moth or maggot. It was often used to repel moths in larders and on clothes. I have also found that woodchucks tend to keep their distance from any stands of this herb, but that’s just my observation and not a scientific theory. Well, that’s one I haven’t seen yet. Vetch and some kind of sedge seem to be my invaders this year. It all depends on where you live, I guess. I’m actually writing a new post on wild (ie weedy) plants. feeling a bit guilty, I had a Stenoglottis, but it left. I remember masses of tiny mauve flowers (another species)! It is listed at PlantZAfrica. Your dirtynailz link goes to http://dirtynailz.wordpress.com/ a dormant blog, not to this one. Would be good if my comments would link to your active blog. That’s strange. Thanks for bringing it to my attention. I’ll check to see what’s going on. The buds on my stenoglottis spikes also look like they will open as purplish pink flowers. I will take photos when that happens.